The rhizoma of Belamcanda chinensis (L.) DC. of family Iridaceae. Hubei, Henan, Jiangsu and Anhui provinces, etc. Dug out at the beginning of sprout in earlier spring or in late autumn when the stem and leaves wither. Light smell, bitter and slightly pungent taste. The one dry, stout at yellow cross-section without fibrous root and soil. Clear heat and remove toxicity, clear lung heat and dispel phlegm, alleviate sore throat and relieve swelling. With the actions of clearing heat and removing toxicity, alleviating sore throat and relieving swelling, and clearing lung heat and dispelling phlegm as well, it is much suitable for treating syndrome of heat-toxicity or lung heat manifested as swollen and sore throat due to turbid-phlegm stagnation. It can be used singly, as She Gan Tang from Sheng ji Zong Lu; and the effect get better when being used with other herbs specialized in alleviating sore throat. For sore throat due to excessive heat-toxicity, it can be combined with other toxicity-removing, sore throat-alleviating herbs. For example, Sheng Ma, Ma Bo and Mang Xiao are combined as in She Gan Tang from You You Xin Shu (New Book of Pediatrics). For sore throat with hoarse voice caused by wind-heat invasion of lung, it can be combined with wind-heat-dispersing herbs to mutually take effects of dispersing wind-heat, clearing lung heat and removing toxicity, alleviating sore throat and relieving pain, for example in She Gan Xiao Du Yin from Zhang Shi Yi Tong (Zhang's Treatise on General Medicine), it is used with Niu Bang Zi and Jie Geng, etc. For the action of clearing heat and removing toxicity, it can also be used either orally or topically to treat heat-toxicity syndromes such as sores, abscess and mumps; its effect gets improved when being used with other herbs for clearing heat and removing toxicity, curing abscess and dissipating nodulation. Because of the actions of clearing lung heat, directing qi downward and dispelling phlegm, it can take effects of relieving cough and asthma, and is used in treating syndrome of cough and asthma characterized by stagnation of excessive phlegm and saliva, wheezing due to retained phlegm in throat. 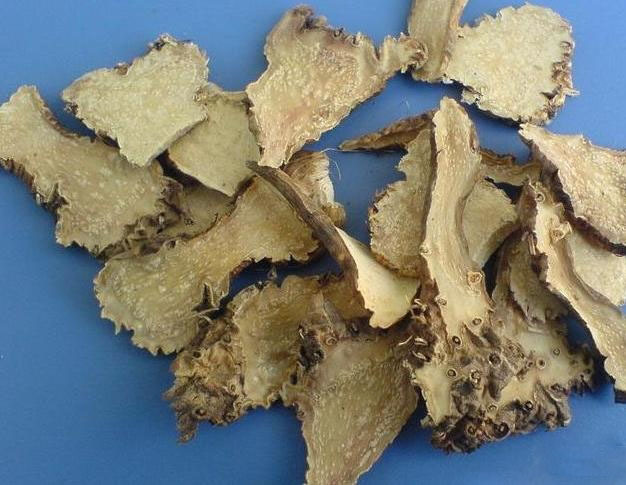 It is much suitable for treating cough and asthma due to phlegm heat for the actions of clearing lung heat, and often combined with herbs for clearing and resolving heat-phlegm, and relieving cough and asthma, for example, Ma Dou Ling, Chuan Bei Mu and Sang Bai Pi, etc., as in She Gan Dou Ling Tang from Sha Zhang Yu Heng (Balance of Measles Rash with Distention). It is also indicated for cough and asthma caused by cold-phlegm, cold drinks, but it must be combined with herbs for warming lung and resolving phlegm, and relieving cough and asthma, such as Ban Xia, Xi Xin, Ma Huang and Zi Wan, etc. , as in She Gan Ma Huang Tang from Jin Kui Yao Lue. In addition, because it has certain action of activating blood and eliminating phlegm, it is also used for amenorrhea, mass malarial nodule, scrofula and subcutaneous nodule. Decoct 6～10 g. Proper dosage is for topical application. It should be used cautiously to patients with loose stool due to spleen deficiency. It is contraindicated to pregnant women.